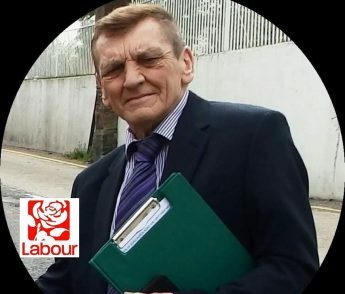 Councillor Dave Harris : Working for Berechurch and Shrub End Residents | County Councillor for Berechurch and Shrub End and Borough Councillor for Berechurch / For the Many! After a year of campaigning for a lamp post to be repaired, Councillor Chris Pearson and I had a mock birthday party for the street light. I had been told that we would have to wait until March for a replacement after the car crash that caused the problem. The picture (above) appeared in local news paper, and then on “Have a got news for you” TV programme getting national air time. Guess what? All of a sudden the post has been replaced. A good result! On 14th November a cheque for 270.70 was presented by Berechurch / Monkwick residents, Cllr Dave Harris and Pete Ramsey to Royal British Legion poppy appeal in colchester main Poppy shop. Anglea Tillet and Sid Kent of Royal british legion took the cheque and expressed thanks to our residents in Berechurch for strong support. During the run up to the 100th anniversary of the end World War one, I visited the Thomas Lord Audley school where young people created a stunning piece of work for the event. Using recycled plastic bottle bases, they painted and mounted them in the form of poppies. I spent time listening to their research and how each poppy had a soldiers name on it. Very impressive knowledge and a big well done to young people and to staff for leading the work.